Game Preview: Bears at Sound Tigers, 1 p.m.
01/21/2019 - Today, the Hershey Bears battle the Bridgeport Sound Tigers, American Hockey League affiliate for the New York Islanders, in a 1 pm. road tilt. The game was originally scheduled for Jan. 20 at 3 p.m. before its postponement. .
RADIO: WQIC-100.1 FM, Fox Sports 1460-AM, Voice of the Bears Zack Fisch on the call. The Bears are coming off a 5-3 win over the rival Wilkes-Barre/Scranton Penguins at the Mohegan Sun Arena on Saturday. The victory pushed Hershey's win streak to a season-high four games. Jayson Megna scored twice, and Mike Sgarbossa, Shane Gersich, and Riley Barber also added goals for the Chocolate and White. Hershey went 3-for-8 on the power play, and added just their second shorthanded goal of the season. Ilya Samsonov stopped 22 shots between the pipes to earn his third straight win in goal. The Sound Tigers are also coming off a victory on Saturday as they defeated Providence 4-3 in a shootout. 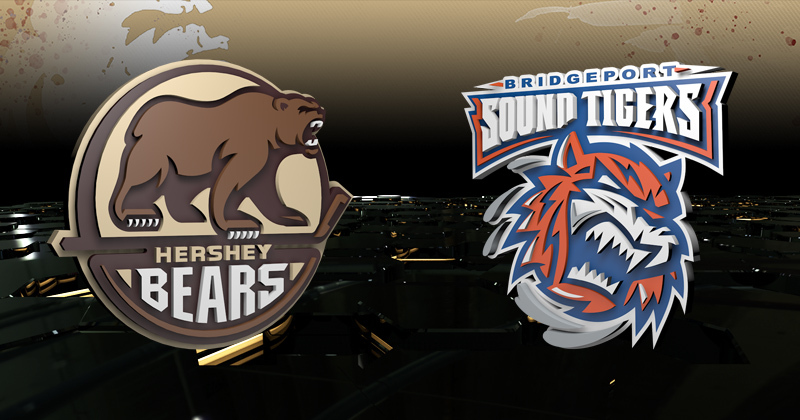 Ben Holmstrom scored at :25 and 3:10 of the third period to pull Bridgeport into a 3-3 tie, and former Bear Chris Bourque and Tanner Fritz scored in the shootout to secure the win. Former Bear Ryan Bourque also had two assists in the victory. Hershey forward Jayson Megna continued his hot hand versus Wilkes-Barre/Scranton with a three-point performance on Saturday. Megna's two goals and an assist gave him his fourth AHL three-point game, and his first since Apr. 15, 2016. Six of Megna's nine goals have come versus the Penguins, and his first tally on Saturday snapped a 14-game goalless drought that dated back to Dec. 9 versus Wilkes-Barre/Scranton. Saturday's game in Wilkes-Barre/Scranton was a milestone night for defender Aaron Ness. The former captain of the Sound Tigers had three assists to give him 100 points (18 goals, 82 assists) in his 205-game tenure with the Chocolate and White. For Ness, it also marked the first time he collected three assists in a single game during his 485 career games in the AHL. He's only the third Bear to post three assists in a game this season, joining rookie forward Garrett Pilon and fellow defender Colby Williams. Ness' 24 assists rank fourth among all defenders the AHL, and he is just two points from matching his best season as a Bear, which was a 29-point campaign in 55 games last season. With a goal and two assists on Saturday, Hershey forward Mike Sgarbossa pushed his point streak to five games. He's racked up seven points (three goals, four assists) in that stretch. The Ontario native leads the Bears in goals with 18, just one away from his career-high 19 goals scored during his rookie season with Lake Erie in 2012-13. He ranks second on the Bears in power play goals (seven) and points (34). He scored in Hershey's previous game versus Bridgeport on Oct. 7. The Bears battle familiar faces Chris and Ryan Bourque in today's contest. Ryan, who has 10 points (three goals, seven assists) played with the Chocolate and White for parts of two seasons from 2016-17. Legendary Bear Chris has the most points of any Sound Tiger on the active roster with 26 (seven goals, 19 assists). He hasn't scored since Dec. 21, but has racked up seven assists in that 12-game span. Chris, a three-time Calder Cup winner with Hershey, scored in the earlier meeting between the Bears and Sound Tigers on Oct. 7 at Giant Center. He has three goals in five career games versus Hershey in the regular season, and an impressive 17 points (six goals, 11 assists) in 11 playoff games versus the Chocolate and White.